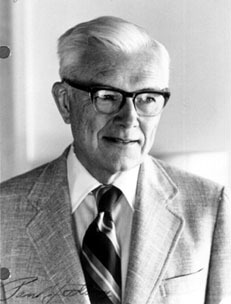 Nobel Prizewinning chemist Paul J. Flory studied the properties of polymers, making important contributions to the understanding of chain conformation, crystallization, elasticity, glass formation, hydrodynamics, liquid crystals, melt viscosity, molar mass distribution, and solution thermodynamics. In 1937, while working at DuPont under Wallace Hume Carothers, he discovered that a growing polymeric chain can terminate its growth and instead start a new chain, if it reacts with other molecules that are present. In 1939 at the University of Cincinnati he developed a theory of polymer networks to explain the process of gelation. He also developed a theory of rubber networks in 1943 and a theory of anistropic solutions in 1956. After his retirement in 1975 he became a public advocate for human rights in the Soviet Union and Eastern Europe.